Great British Spring Clean (22nd March – 23rd April ), are calling on Litter Heroes across the country to help improve the environment on their doorstep. They’re aiming to inspire 500,000 people to join forces – in partnership with community organisations, businesses and the government – to collect and safely dispose of single-use plastic from our streets, parks and beaches, recycling as much as possible. So join us, as we prepare to stand together and declare that single-use plastic litter – which degrades the beauty of our environment and threatens to harm wildlife – is not acceptable. On the first of December, several members of our local group attended the “March for Climate Justice” in London. Travelling by train and foot, 6 members of WFoE contributed to the masses protesting for climate justice. 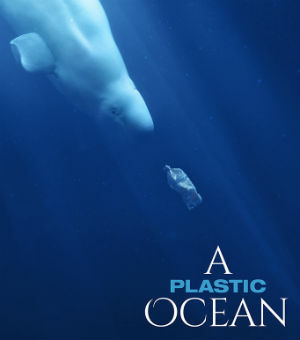 On the 20th of November, Wycombe Friends of the Earth organised a public viewing of A Plastic Ocean (trailer link) , a hard-hitting and informative film about plastic pollution and the damage it is doing to our oceans, wildlife and health. The full-length film conveyed the desperate state of our oceans around the world, it seems that microplastics are now ingested by virtually all sea creatures. Many seabirds were all also found to be suffering horrible deaths from consuming larger pieces of plastic debris. Trying to rid the seas of this contamination is now considered almost impossible. We urgently need to step up our fight against the unnecessary use of plastics. 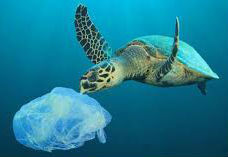 particularly single-use plastics, in the hope of preserving some life in the oceans. At the end of the evening, a lively debate took place, with many attendees contributing to the discussion on this most important topic. Also on Sunday the 16th, we had our Plastic Free Picnic. This was a fun community event on the Rye which supported a reduced plastic future by making a picnic as plastic free as possible. a good time was had by both adults and children. Wycombe Friends of the Earth hosted a public presentation by Julia Spragg of Oxford Greenpeace. We thank Julia for her excellent and interesting talk on “Rainbow Warriors and Creative Confrontation“. The talk covered Greenpeace’s approach to campaigning, past and current campaigns – in particular for the defence of the Antarctic ocean and wildlife. There were many excellent questions raised by the attendees, and much thought-provoking discussion ensued, all in all, a very worthwhile evening. 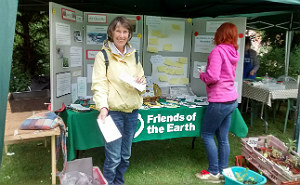 Three WFoE members attended ‘Politicon’ on behalf of Wycombe Friends of the Earth. Politicon is an event at John Hampden Grammar School in High Wycombe, on 8th February 2018 inviting local political parties and organisations to showcase their activities for local sixth form pupils. The event was well attended and a member of WFoE, made a comment about jobs, climate change and renewables during the discussion in the last part of the evening. by a series of banners placed around the town. 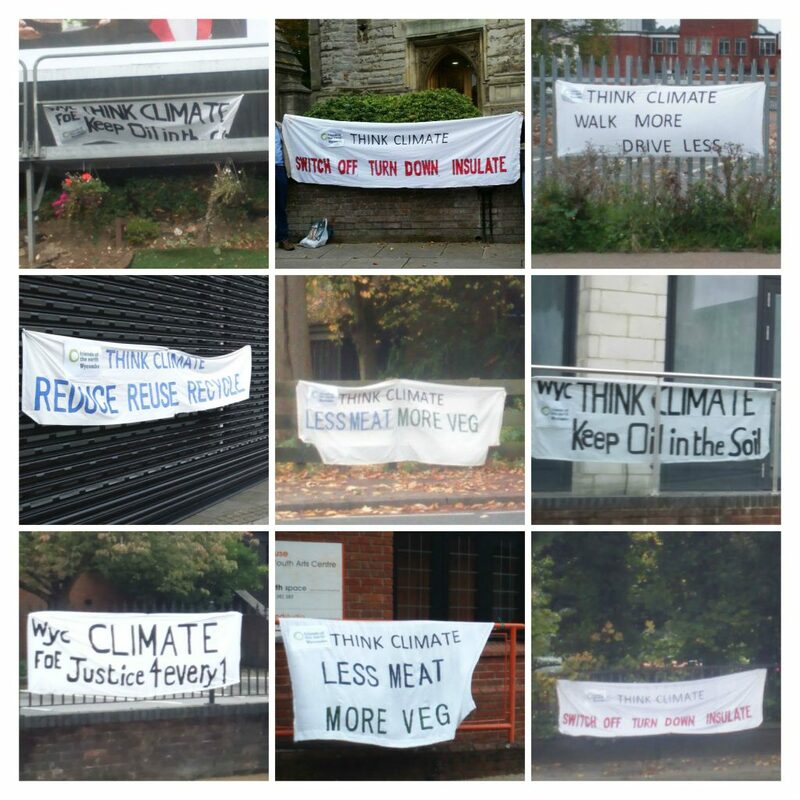 The people of High Wycombe were urged to Think Climate by a series of banners placed around the town, as Wycombe Friends of the Earth’s contribution to a global Day of Action. The Vegan talk during the WFoE meeting was well attended. The room was comfortably full with an audience of about 28 plus 2 presenters (Haz and Charmaine). WFoE co-coordinator Mike Chadwick chaired the business part of the meeting, which was soon followed by the Vegan presentation and a lively discussion. Vegan food/drink samples were offered after the discussion. If you weren’t able to attend, note that Vegan substitutes (e.g. almond or oat milk) are available in most large supermarkets. Do try these at least once! To stay in touch with future Vegan events in High Wycombe follow @earthlingsexperiencehw on Facebook or ask Nigel, an activist running the Animal support / Vegan stall in the Eden Centre opposite Tesco (Fridays 12-3pm, ish). FoE Campaigners, promote the importance of clean air. At least one of the passers-by got the message! 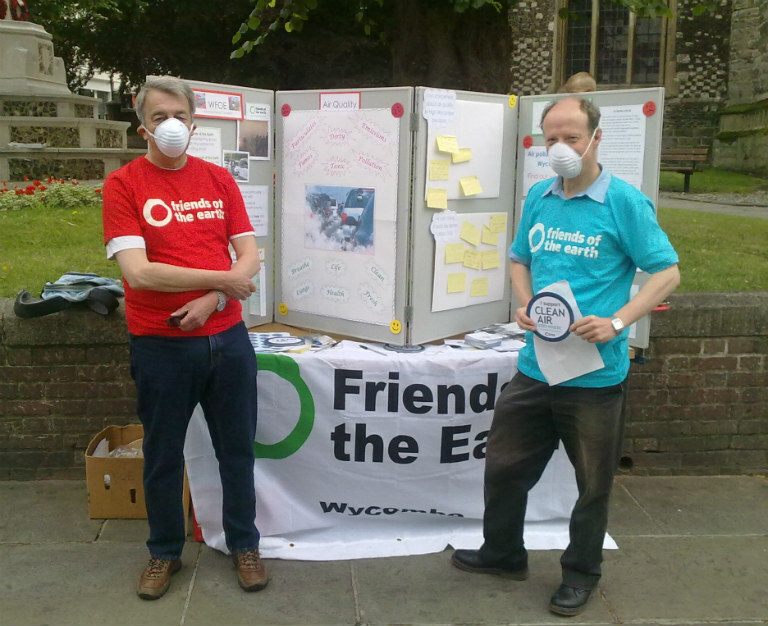 Passers-by joined the call for action to improve Wycombe’s air quality at Wycombe Friends of the Earth’s recent town centre stall. Bad air quality, chiefly arising from traffic fumes, is thought to cause 40,000 premature deaths in the UK every year. It is also thought that air pollution stunts the development of children’s lungs, leading to problems in later life. Official figures, along with recent short-term monitoring by the group, show that nitrogen dioxide levels exceed the legal target on many of the main roads in and around High Wycombe and Marlow. Friends of the Earth is thus calling on government to take urgent and effective action to clean up our air, including the phasing out of the dirtiest diesel vehicles. 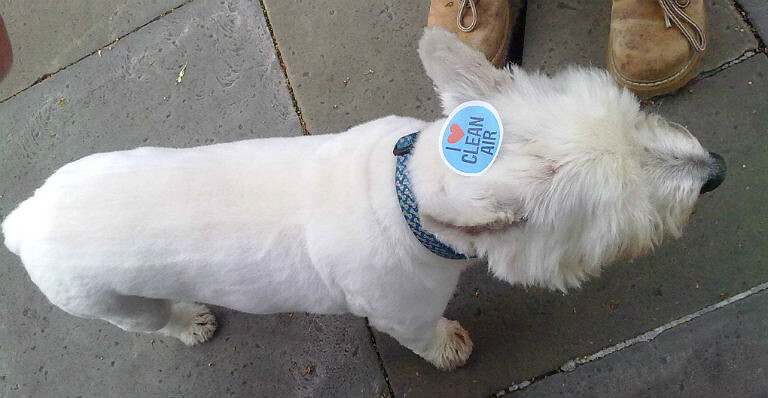 As part of our current clean air campaign, we have produced a Quick Guide for self-help. Children with nothing to do? – then see our Junior FoE page for ideas. See our Air Quality Poster. 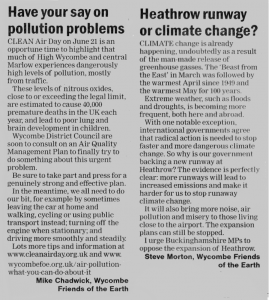 Wycombe Friends of the Earth has warned South Bucks to not be “complacent” about pollution levels on a busy High Wycombe road. See the BFP article. 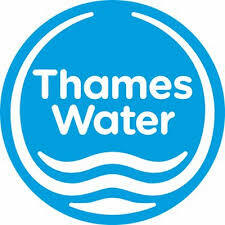 We are currently arranging a meeting with Wycombe District Council, in order discuss air pollution in the Wycombe area, and the way in which it is measured. As part of our clean air campaign, we have produced a Quick Guide, for self-help. During our June meeting, we had a superb presentation from a member of Revive the Wye, We were truly impressed by the amount of great work that has been achieved. Find out more here. If you have time please try to support this local cause. The evening was deemed a great success, with the venue being almost full to capacity. 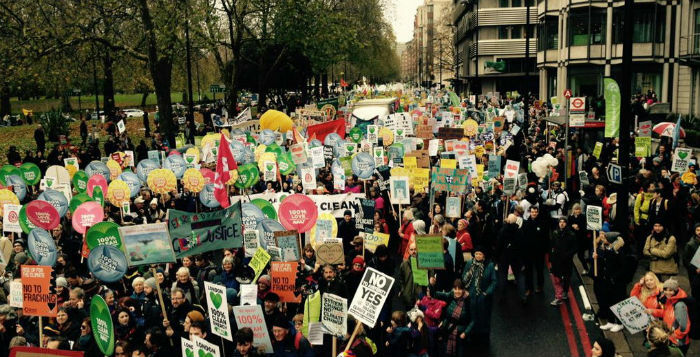 A number of members of Wycombe Friends of the Earth travelled by train to join thousands of marchers at this London event on the 29th of November 2015. This was ahead of the Climate Change Talks in Paris which we hope will produce a positive outcome for our beautiful planet. thought to be the biggest ever UK lobby on climate change. 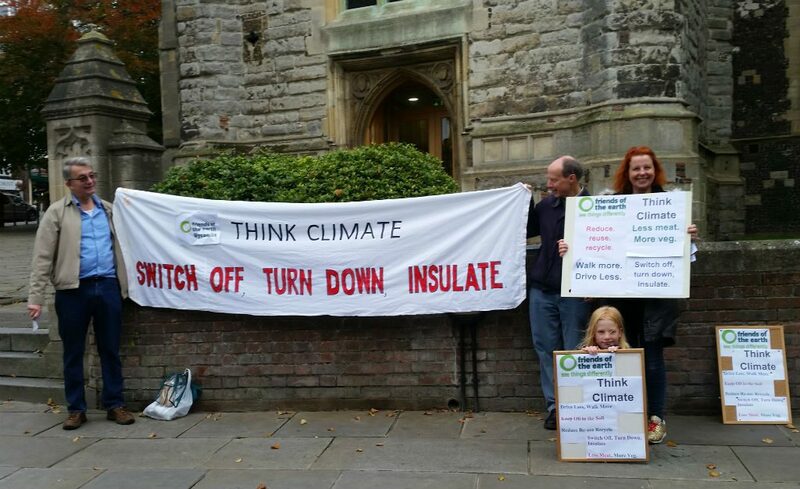 The event was organised by the Climate Coalition, a group of charities, unions and faith groups. The whole day was well planned and managed. It maintained a very happy atmosphere and was well attended. Most importantly over 300 MPs were lobbied! More information from National FoE. 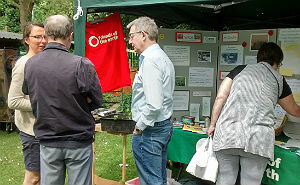 To help promote our Bee Campaign, Wycombe Friends of the Earth ran a stall at the Pann Mill Open Day in High Wycombe on 10th May 2015. It was a pleasant day in the beautiful Pann Mill garden with the water mill turning and grinding wheat. We talked to people about the importance of bees and encouraged bee friendly garden planting or, even easier, leaving a patch of garden to ‘run to weed’! We sold some plants, had ‘bee biscuits’ available, and also distributed copies of our updated, beautifully illustrated, 2015 bee leaflet that gives information about bees and local walks, as well as craft activities for primary aged children. If you would like a leaflet, you can view and download the leaflet below. Alternatively, there are leaflets available at Arts4every1 in Desborough Road, High Wycombe, Wycombe Environment Centre and also at High Wycombe library. Let us all bee friendly! Part of our support for the Friends of the Earth “Bee Cause” campaign. Bee related facts & activities in the Wycombe area. Why not make a “Bee Hotel” to help our little friends. See our list of Bee Friendly Plants by month of flowering. A documentary about the disappearance of Bees. Wycombe Friends of the Earth became part of the Marinet campaigning group, because we are concerned about the multiple threats to Britain’s marine environment, and we support the urgent need to create an effective network of marine protected areas. WFOE continue to support Marinet in this important cause.